Councillor Chansey Paech has asked council to provide police with information about skating in northern Todd Mall, where skate-able street furniture has been provided. As we reported last week bike riding and skating are not prohibited in this part of the mall, a street open to traffic, but remain banned in the pedestrian southern end of the mall. 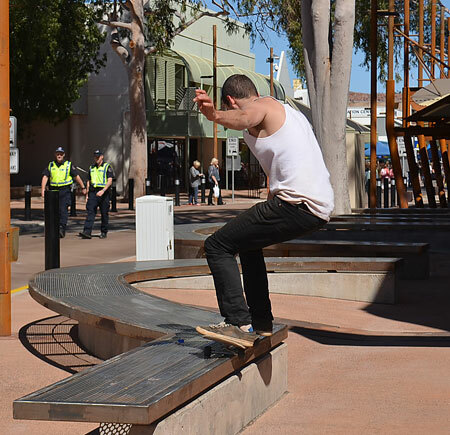 The Alice Springs News Online told Cr Paech last week that young people attempting to have a skate on the new furniture had been pulled up by police. According to a young man the News spoke to, this happened twice last Wednesday, once to himself and a friend at about 9pm, and once to a group of younger skaters about an hour earlier. The young man said he respectfully told police that he understood the matter had been raised at the council meeting (having read about it on the News site) and that indeed the street furniture had been designed for skating. The police told him that they were unaware of the change and said they would look into it. As this picture shows, yesterday afternoon these two lawmen seemed unperturbed by this skater exercising a “grind” on metal furniture, designed for this purpose, in the new section of the mall. I had no idea the furniture was skate board friendly until the News told me, thank you so much to everybody involved in its implementation and creation.